Florida International University (FIU) is pursuing commercial partners interested in developing Superpolar chromatographic stationary phases and extraction sorbents. Poly(ethylene glycol) is commonly used as a polar polymer for immobilization on a substrate’s surface. However, immobilization of polar polymers, including PEG, on a substrate’s surface is still considered a challenge to surface chemists. The resulting substrates often display long extraction time, low solvent resistance, and low thermal stability. 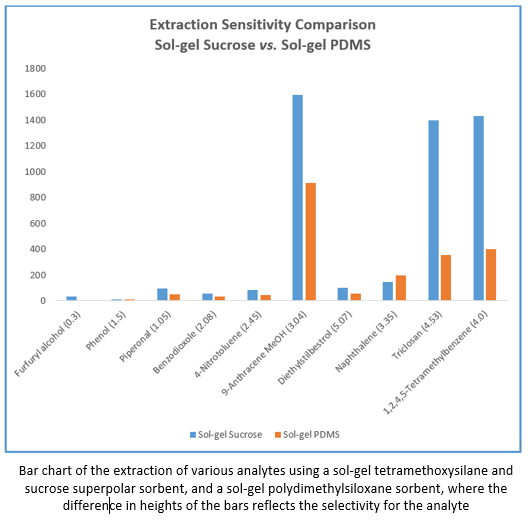 In addition, even though the incorporation of PEG polymer in the sol-gel matrix (sol-gel coating technology) improves solvent resistance and thermal stability of the composite material, the limited polarity of PEG remains a problem when employed to target very highly polar analytes. FIU inventors have designed and synthesized highly polar chromatographic stationary phases and adsorption sorbents comprising a sol-gel network of metal(s) oxide precursor condensed with highly polar polyhydroxy molecule(s). This synthesis offers a simple and environmental friendly approach of immobilization of highly polar molecules to a metal oxide network for use as superpolar stationary phase and/or extraction sorbent. The resulting superpolar sorbent networks can have properties derived from being a sol-gel inorganic/hybrid organic-inorganic polymeric network that can be formulated to display adjustable porosity, tunable selectivity, high thermal stability, solvent stability, and wide pH stability. Call Anne-Laure “Anlo” Schmitt-Olivier at 305-348-5948 or fill out the quick contact form below.